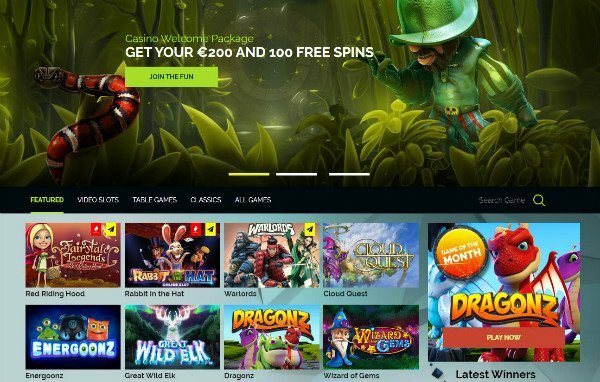 While Wixstars Casino may not sound like a casino or even look like a casino, but browse around and you will discover a wealth of exciting gambling opportunities on par with some of the most traditional online casinos in the business. In fact, you can expect a complete online gaming experience at Wixstars, including an extensive games lobby, generous promotions, 24/7 customer support, as well as a live casino and mobile gaming opportunities. The casino's look and feel is what makes it stand out and offers a design and layout that is as eye-catching as it is unique. Plenty of fun and quirky characters join you on your winning journey with Wixstars, all designed using 3D graphics and aesthetically pleasing colours. The homepage is kept simple and user-friendly. The main menu consists of various links to some of the casino's most relevant pages, including the Casino Lobby, Promotions, Live Casino and VIP Club. The current casino jackpot is also advertised on the homepage as extra inspiration for players, while the FAQ and About US sections also appear as you scroll down the page. Finally, the homepage footer features additional useful links. 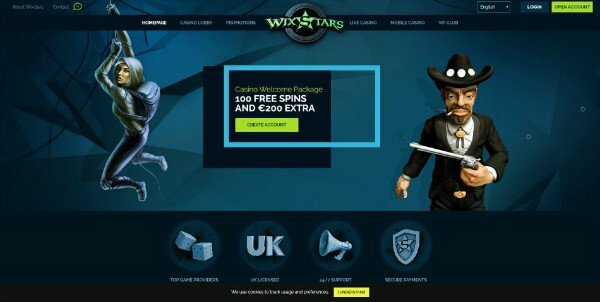 Wixstars online casino was launched in 2016, making it one of the newest online casinos to enter the market. Operated by BrightNet, a Romanian company, the casino itself is powered by Aspire Global International and licensed by the Malta Gaming Authority and the UK Gambling Commission. Safety and security is of course a top priority at this casino as it features the latest 128-bit SSL encryption technology for the protection of personal data and information. Wix stars gmaes section offer players the opportunity to instantly access the games lobby via your web browser without the need to download any software. This is a route many online casinos have taken to make your gaming experience that much more convenient and enjoyable. All you have to do to start playing is visit the casino website, log in to your account and you will be ready. If you prefer, you are welcome to download the casino as well. Mobile players will also be spoilt for choice as a wide selection of games are available straight from the palm of your hands while on the move. The fully-optimised online casino makes for smooth and seamless gaming while on the move directly from your Android or iOS mobile device. The games lobby is one of the highlights of any online casino, and Wixstars does not disappoint. All your favourites can be founded nestled in the extensive games lobby, including titles by renowned software providers like Microgaming, NextGen, WMS, NeoGames and NetEnt. This gives Wixstars the added advantage of being a multi-platform casino, giving players even more exciting playing and winning opportunities. Another advantage is that many of the games at Wixstars are available to play for free. This allows you to get a feel for the game before betting any real money. New players are therefore advised to try this option when checking out the games lobby for the first time. As far as game categories are concerned, you will find all the most popular options like Featured, Video Slots, Video Poker, Table Games, Classics and All Games and even a thrilling Live Casino for those looking for a more realistic online gaming experience. Online slots are of course a popular option, and you will find a host of titles featured in the lobby, including Jack and the Beanstalk, Jimi Hendrix, Starburst, Superman, Dracula, Warlords and Game of Thrones. Besides slot games, there are a host of other gaming attractions that will picque the interests of the most discerning players. You will find all the usual suspects in terms of table games, including Blackjack, Roulette and Baccarat, as well as live versions of these games for a completely immersive experience. Real dealers oversee the live games and all the action takes place in real time, as if you were playing in an actual casino without leaving the comfort of your home. You will also find a variety of video poker games that are available in both single and multi-hand versions. As is standard, new players are welcome to the casino is the most generous way with a sign-up bonus, which can be claimed once you make your first deposit. In addition, existing players can make use of the exclusive VIP Club to earn extra benefits and rewards. 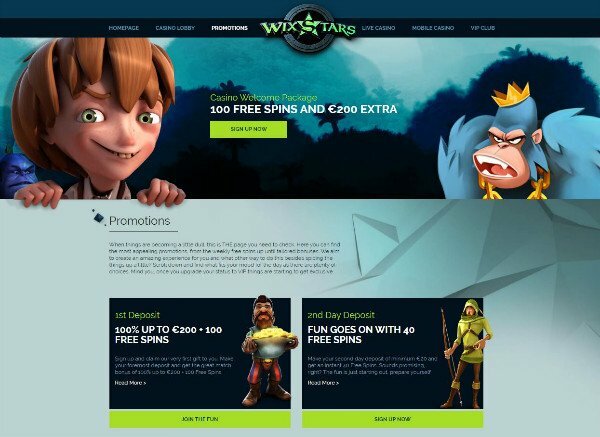 To get you started on your road to great wins, Wixstars has decided to grant you an incredible welcome package, which consists of a 100% match bonus up to £200 and a massive 100 free spins to use as your discretion. Upon your first deposit, you will receive 20 of these free spins, with the rest being awarded over the next two days for every £20 deposit made. Please bear in mind that there is a 35x wagering requirement that needs to be met in order to claim this welcome bonus. In terms of additional bonuses and promotions, there isn't much else going on at Wixstars, although the casino is still brand new, so we expect some advantages in this area in the coming months. What the casino does offer is a great VIP Club that existing players can take full advantage of. Many casinos offers some kind of loyalty program to reward dedicated players, and Wixstars has followed this tradition with its own VIP Club. The VIP Club uses a hierarchy system that players must move through to be granted bigger and better rewards. Players will require just 10 points to become a VIP Bronze Member, where you can enjoy benefits like fastcash outs and free games on a Sunday. For 60 points, you will become a Silver member, where you receive 10 free games. If you earn 350 points you will become a Gold member, while 1 000 points earns you Platinum status. This level lets you enjoy additional perks like 40 free games and express fast cash outs, among others. The top level - VIP Premium, is an invite-only option, and awards players even more benefits for their dedication and loyalty to the casino. Wixstars casino payments ticks all the boxes in terms of functionality, gaming options and site design, but how does its banking rate? Luckily, players will be happy to learn that Wixstars is on top of things when it comes to safe and secure online banking. The casino offers a host of popular, convenient and reliable banking options for both deposits and withdrawals, including Skrill, Visa, MasterCard, Paysafecard, Neteller, credit and debit cards and bank transfers. The majority of these payment methods will clear instantly, although credit card payments can take up to three days. This makes banking with Wixstars a breeze. The customer support at Wixstars are what dreams are made of, and players can expect a fast and efficient response to whatever query you may have. The support team is available at all hours to assist with whatever issue you may have, and can be contacted via email, live chat or telephone. Wixstars Casino is indeed a unique and fun-filled gambling destination, ideal for both new and experienced players looking for something different. The casino is designed to appeal to the child in you, with bold colours and charming characters featured throughout the site. But this does not mean the casino is immature in any way, in fact, it offers quite a sophisticated gaming experience. The casino is user-friendly and functional while still being attractive, which is what every online casino should aim towards. Creating a comforting and pleasant look and feel is as important as any other factor at an online casino, and Wixstars gets full marks on all fronts. wixstars.com offers a fascinating online gambling experience, which is impressive since it is relatively new to the market. It is lovely to look at and has a games lobby to match, not to mention a generous welcome package and VIP Club that adds the cherry on top. While the striking looks of the casino is no doubt a strong feature, the excellent banking options and fully dedicated customer support team give the casino extra points. This casino is a great new addition to the online gambling market.